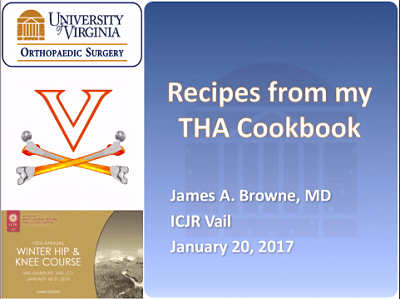 Like master chefs in the kitchen, orthopaedic surgeons can be masters of total hip arthroplasty by consistently following their own “recipe” for the procedure. That was the premise of a session at ICJR’s Winter Hip & Knee Course, during which 5 master surgeons shared a brief overview of how they do most of their total hip arthroplasties. Moderator James A. Browne, MD, from the University of Virginia in Charlottesville, then followed up with questions that probed at the specifics of what the surgeons do and why they do it.